Iranian authorities appear to have once more fallen back on their old way of dealing with people’s protests. 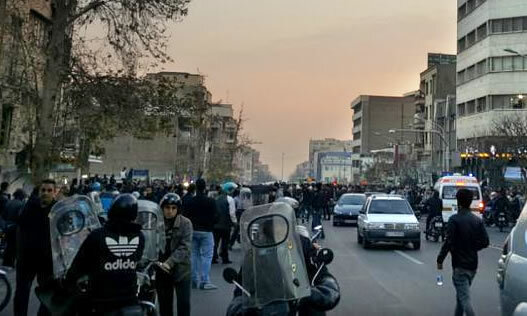 The continued street protests of Iranian citizens has caught Iranian government by surprise. At first they tried to completely deny the existence of protests. Then for the first time in the history of the Islamic Republic, Iranian authorities announced that they acknowledge the legitimacy of the people’s economic woes and their protests but urged them to stir clear of rioters. Then Ali Shamkhani, head of the Supreme National Security Council referred to protesters as agents of Mossad and Saudi Arabia. The Revolutionary Guards then pitched in saying they are prepared to put an end to the protests and the state media is now consistently airing patriotic music and urging the public to participate in the state organized demonstrations on January 5. If the situation somewhat calms down, Ali Khamanei will come out with a threatening speech, but if the protests persist, the leader will resort to crying on air and try to rally the pious and religious by tying himself in to the 12th Shia Imam who is to appear on the Judgement Day. With this pattern in view, we can see a change in the approach of the oppressive forces. Last night when protesters headed back to the usual protest locales they noticed that all traces of their protests from the night before were completely cleared off. All the street lights were fixed. The traffic signs that were uprooted to block the roads had been reinstalled. Garbage bins were changed and every residue from the fires were cleared off. The spots were also occupied by security forces and in the peripheries of the locations groups of people in civilian clothes were standing in clusters. It was not clear whether they were state agents or not. Closer, the view changed. Plain clothes forces stood with helmets and batons. Closer still some stood in masks holding shotguns. Reports from many cities reveals that Basiji para-military and masked plain clothes forces outnumbered masked protesters last night on Jan 4th. People are in their cars looking for protest hubs. Masked individuals in helmets carrying batons move around the cars. They look threateningly at the drivers and if the passengers of the cars happen to be young women, they will persist more in their intimidation tactics eying them and pulling their batons on the body of their cars. However as they approach they appear comical. They cannot be more than fifteen years old. They look like youths who have spent a few days at the gym and are now showing off with poses in the mirror. The older ones are even more comical. One who has gone overboard trying to hide his face is caught by a woman putting out her head from a car saying: “Hi Mr. Massoud. Are you with your wife or have you come to the protests alone?” Alluding to others that she knows him. It is not easy to say where the system has drawn these forces from but two different groups are among them. One group is intent on hiding their identity and another, younger group of between 15 to 20 who like to show off their power and for that sometimes even go unmasked. The state tactic is to prevent any gathering because they know as soon as protesters crowd together, people are drawn to them and stand with them against security forces so it becomes impossible to handle them. The tactic was successful in downtown areas but as a result the other parts of the cities protesters engaged in more intense protests. There were reports of attacks on Basij offices and burning of Ali Khamenei’s photograph in many cities. People are feeling down. They want to join a crowd of protesters like the other nights and chant slogans together but it is not possible. A few young men on motorbikes quickly pass the plain clothes forces and one of them when certain that he is far enough to get away shouts out: “You can’t come and stand here every night! We will return again when you leave.” Then he presses on the gas and disappears into the night.